Efficiency remains a resource of immense opportunity for the U.S. and the region. The Northeast states already are national leaders in their per capita energy efficiency, and the utilities in the region, electric and natural gas, have been active for years in efficiency programs. Industry collaboratives such as GasNetworks in several Northeast states continue to provide innovative ideas for gas customers on new energy-efficient technologies and equipment. As the American Council for an Energy-Efficient Economy (ACEEE) has noted, efficiency opportunities exist in multiple sectors: "While the roots of natural gas efficiency programs lie within residential markets, there are now programs serving multiple types of natural gas customers - from homeowners to large industries. There are opportunities for improved energy efficiency across the spectrum of customers and technologies using natural gas. Programs may target specific technologies that use natural gas, such as furnaces, water heaters, boilers, and cooking equipment, or they may target the systems and facilities that are served by natural gas technologies. Improving the thermal envelope of buildings is one example of programs that address whole buildings." 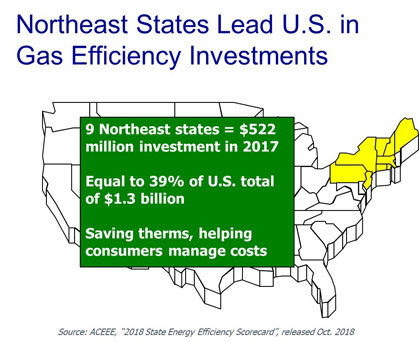 The 2018 annual ACEEE State Scorecard for Energy Efficiency, which looks at both electric and natural gas programs, found that five Northeast states were in the top 10 in the U.S.: MA, RI, VT, CT, and NY. In 2017, $1.34 billion was invested in natural gas efficiency programs nationwide, according to the ACEEE. Of that, 38.8% of the national total ($522 million) was invested in the nine Northeast states alone (CT, ME, MA, NH, NJ, NY, PA, RI and VT). These program investments - and energy savings - will continue in coming years.